There are a handful of city blocks in Nashville, Tennessee, that constitute the area known as “Lower Broadway” on Broadway Avenue. Known as the city’s premier hotspot for live music, this area attracts a wide variety of patrons: regulars, locals, and tourists. What brings them together is a mental concept of “Old Nashville,” rooted in feelings of nostalgia and romanticization for the city’s golden era, which I broadly define as the mid-1920s through mid-1960s. The most important reason why I chose Lower Broadway as a research area, and the one that is most relevant to this study, is that it is a crossroads for listeners’ musical and bodily interpretations of authenticity in country music. In other words, Lower Broadway is site where it is important for performers to look and sound like the real thing. What is the real thing, and how does one perform this ideal authenticity? Additionally, who is in search of this Nashville authenticity? The band included on the poster, Phil Hummer and The White Falcons, are professional musicians on Lower Broadway. Since the band performs music often labeled “rockabilly,” or what they refer to as “hard hillbilly,” they are not the typical “country” Broadway band. Furthermore, the trio is made up of two females and one male – a rare configuration for both Broadway and rockabilly bands. As a whole, The White Falcons provide an effective case study with which to explore gender and “Nashville authenticity” in the honky-tonks. 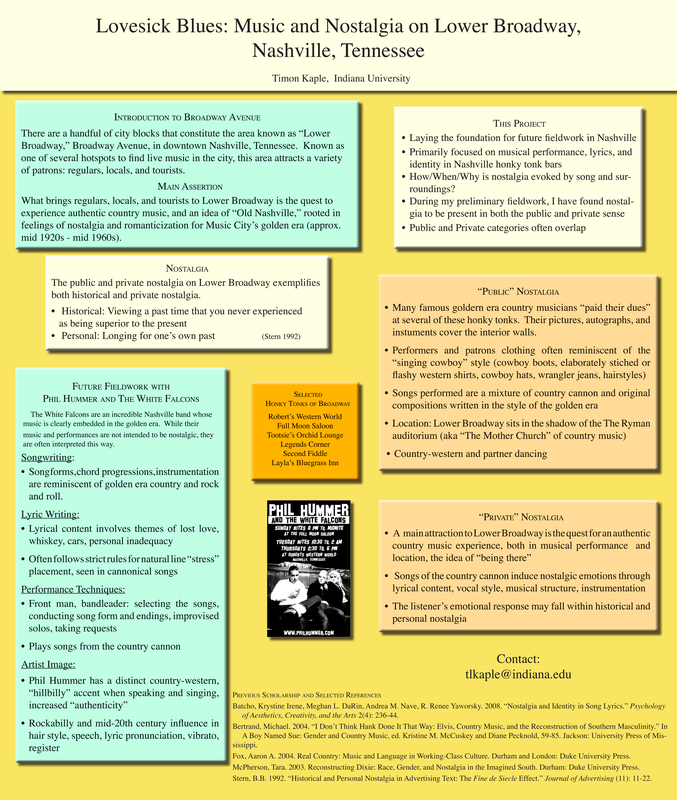 After the creation of this poster, I conducted fieldwork with the band and examined the ways in which they are affected by romanticized stereotypes, as well as the preconceived notions about Nashville musicians held by their audiences. Robert’s Western World is an archetypal Lower Broadway honky-tonk for the study of nostalgia and authenticity. The nostalgic feelings for Nashville’s golden era exist at Robert’s in several forms and are present in both the public and private sense. The interior walls are covered with murals, photos, and autographs of famous country music stars from this bygone era, several of whom began their careers at Robert’s. The regular performers, including The White Falcons, wear stage attire that evokes the golden era country performers, or brings to mind classic American, simple, mid-20th century fashion. The majority of performers hired by Robert’s play songs from a canon of country standards, as well as original compositions containing standard golden era lyrical themes, or motifs, of heartache, working-class strife, and addiction. Whether these lyrical motifs are updated by the songwriters to more accurately reflect the modern social climate is irrelevant. A motif’s continuity, or transcendence of time, in any lyrical context is enough for the audience to recall, and make connections with, features of the golden era. The private component exists in the minds and hearts of the dancing, drinking, music-seeking patrons who form the daily congregation. For many individuals, the idea of “being there,” in the heart of the country music industry where the old “authentic” exists, is exhilarating. Furthermore, the tangible materials seen on Lower Broadway are assigned meaning by the individual, in a private space, which later informs collective thoughts among groups. Despite all of the visual stimulation at Robert’s and other honky-tonks, the music is the main source of entertainment and the framework around which collective nostalgia is formed on a daily basis. The canonical country songs induce nostalgia through lyrical content, harmonic progressions, and song structure. I acknowledge that these cognitive connections are not necessarily made by all audience members, as this depends on the individual’s perceptions and background. It is safe to say, however, that the explicitly stated themes in the canonical songs, as well as other aesthetic and sonic features of the music and performance, are likely to generate some kind of relationship between the present-day Nashville and the golden era Nashville. Furthermore, not everything at the honky-tonk is experienced in reference to the golden era. The concept of “Old Nashville” is simultaneously experienced and created, but does not preclude real-time experience. The scope of this poster does not extend beyond illustrating the nostalgic side of authenticity perception as it applies to Lower Broadway and The White Falcons. A more detailed account of my fieldwork in Nashville can be found in my forthcoming masters thesis. The general public today chooses just what exactly it wants for amusement, definitely not the leading studios and representatives. At the time you add to that distribution internet and, media, websites, from chat to whole motion pictures. It’s actually a completely new world. A lot of it very good, some not.